Firm: Ford & Cooper, P.C. Ed Ford has been a practicing attorney since his graduation from the University of Missouri Law School in 1978. 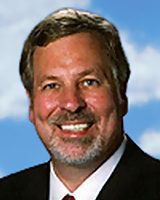 He has been a partner in the law firm of Ford & Cooper, P.C. (formerly Ramsay, Ford & Hiles) since 1983. Ford & Cooper, P.C. is still at its original location in the Commerce Bank Building in Kansas City. Ed Ford engages in the general practice of law, with a heavy emphasis on personal injury cases and family law. However, Mr. Ford has represented clients in a variety of legal matters, including felony charges, driving while intoxicated, traffic matters, drafting of wills and trusts, probate matters, civil litigation, and Social Security disability. He has also had considerable experience practicing law related to small businesses, including the setting up of corporations and limited liability companies. If circumstances take a turn for the worse and you suddenly find yourself in need of an experienced attorney, call on the services of Ford & Cooper, P.C. We serve Clay, Platte, and Jackson counties with integrity. Plus, we know the legal system inside and out, backward and forward. If you want an attorney who can deliver the results you deserve, don’t delay. Contact us today and schedule your initial consultation.